Narrations and timings can enhance a web-based or self-running slide show. If you have a sound card, microphone, and speakers, and (optionally) a webcam, you can record your PowerPoint presentation and capture narrations, slide timings, and ink gestures. After you have made the recording, it's like any other presentation that can be played for you or your audience in Slide Show—or you can save the presentation as a video file. 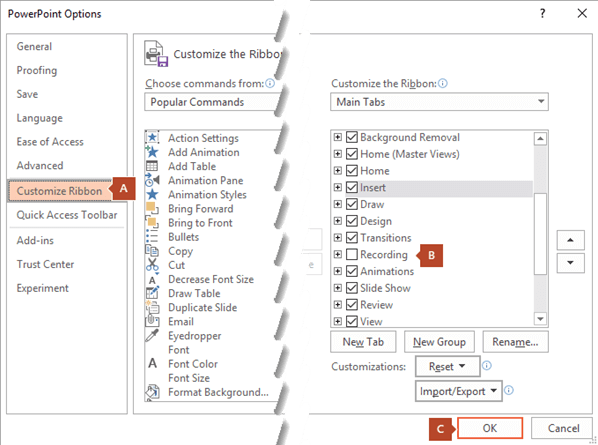 Turn on the Recording tab of the ribbon: On the File tab of the ribbon, click Options. In the Options dialog box, click the Customize Ribbon tab on the left. Then, in the right-hand box that lists the available ribbon tabs, select the Recording check box. Click OK.
To get ready to record, select Record Slide Show on either the Recording tab or the Slide Show tab of the ribbon. Clicking the upper half of the button starts you on the current slide. Clicking the lower half of the button gives you the option to start from the beginning or from the current slide. The slide show opens in the Recording window (which looks similar to Presenter view), with buttons at the top left for starting, pausing, and stopping the recording. Click the round, red button (or press R on your keyboard) when you are ready to start the recording. A three-second countdown ensues, then the recording begins. The current slide is shown in the main pane of the Recording window. You can stop the recording any time by pressing Alt+S on your keyboard. Navigation arrows on either side of the current slide allow you to move to the previous and next slides. 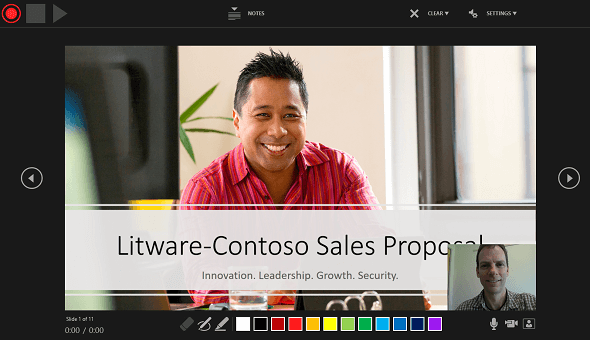 PowerPoint for Office 365 automatically records the time you spend on each slide, including any Animate text or objects steps that occur, and the use of any triggers on each slide. If you use the pen, highlighter, or eraser, PowerPoint records those actions for playback also. If you re-record your narration (including audio and ink), PowerPoint erases your previously recorded narration (including audio and ink) before you start recording again on the same slide. You can also re-record by going to Slide Show > Record Slide Show. To end your recording, select the square Stop button (or press S on your keyboard). When you finish recording your narration, a small picture appears in the lower-right corner of the recorded slides. The picture is an audio icon, or, if the web camera was on during the recording, a still image from the webcam. In this process, what you record is embedded in each slide, and the recording can be played back in Slide Show. A video file is not created by this recording process. However, if you need one, you can save your presentation as a video with a few extra steps. On the Slide Show tab, click From Beginning or From Current Slide. During playback, your animations, inking actions, audio and video will play in sync. In the Recording window, the triangular Play button near the top left corner lets you preview the recording of the slide that currently has the focus in that window. You can pause playback while previewing the audio. PowerPoint for Office 365 automatically records your slide timings when you add narrations, or you can manually set the slide timings to accompany your narrations. In Normal view, click the slide that you want to set the timing for. On the Transitions tab, in the Timing group, under Advance Slide, select the After check box, and then enter the number of seconds that you want the slide to appear on the screen. Repeat the process for each slide that you want to set the timing for. If you want the next slide to appear either when you click the mouse or automatically after the number of seconds that you enter — whichever comes first — select both the On Mouse Click and the After check boxes. You can use manual slide timings to the trim the end of a recorded slide segment. For example, if the end of a slide segment concludes with two seconds of unnecessary audio, simply set the timing for advancing to the next slide so that it happens before the unnecessary audio. That way you don't have to re-record the audio for that slide. The Clear command is for deleting timings or narration from your recording that you don't want or that you want to replace. If you do not want to delete all the timings or narration in your presentation, open a specific slide that has a timing or narration that you do want to delete. On the Recording tab of the PowerPoint for Office 365 ribbon, on the Record Slide Show button, click the down arrow, point to Clear, and then choose the appropriate Clear command for your situation. To turn off recorded slide timings: On the Slide Show tab, clear the Use Timings box. To turn off recorded narrations and ink: On the Slide Show tab, clear the Play Narrations box. Once you've edited the recording to your satisfaction, you can make it available to others by publishing to Microsoft Stream. With the presentation open, on the Recording tab, select Publish to Stream. Once you have a closed-caption file, you can add it to your video file by using PowerPoint. With your presentation open, on the Slide Show tab, click Record Slide Show. In the Record Slide Show box, check or clear the boxes for your recording, and click Start Recording. Slide and animation timings: PowerPoint automatically records the time you spend on each slide, including any animation steps that occur, and the use of any triggers on each slide. Narrations, ink, and laser pointer: Record your voice as you run through your presentation. If you use the pen, highlighter, eraser, or laser pointer, PowerPoint records those for playback as well. 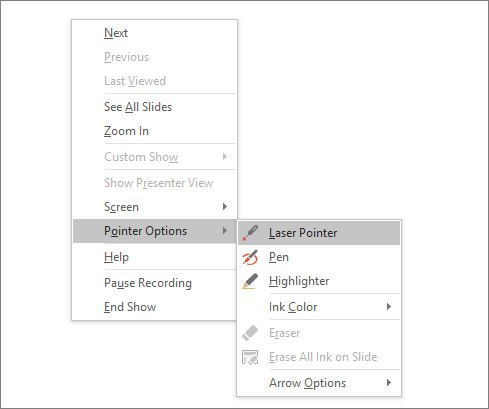 Important: Pen, highlighter, and eraser recording are available only if you have the February 16, 2015 update for PowerPoint 2013 or a later version of PowerPoint installed. 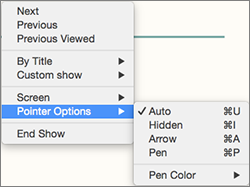 In earlier versions of PowerPoint, pen and highlighter strokes are saved as ink annotation shapes. To change the color of the ink, click Ink Color. To end your recording, right-click the final slide, and click End Show. Tip: When you finish recording your narration, a sound icon appears in the lower-right corner of each slide that has narration. In this process, what you record is embedded in each slide, and the recording can be played back in Slide Show. A video file is not created by this recording process. However, if you want a video file, you can save your presentation as a video with a few extra steps. During playback, your animations, inking actions, laser pointer, audio and video play in sync. In Normal view, click the sound icon in the lower-right corner of the slide, and then click Play. 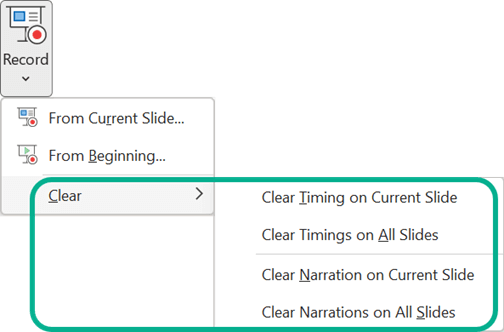 PowerPoint automatically records your slide timings when you add narrations, or you can manually set the slide timings to accompany your narrations. On the Transitions tab, in the Timing group, under Advance Slide, select the After check box, and then enter the number of seconds indicating how long the slide should appear on the screen. Repeat the process for each slide that you want to set the timing for. Tip: If you want the next slide to appear either when you click the mouse or automatically after the number of seconds that you enter—whichever comes first—select both the On Mouse Click and the After check boxes. 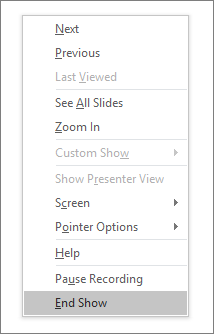 On the Slide Show tab of the PowerPoint ribbon, on the Record Slide Show button, click the down arrow, point to Clear, and then choose the appropriate Clear command for your situation. 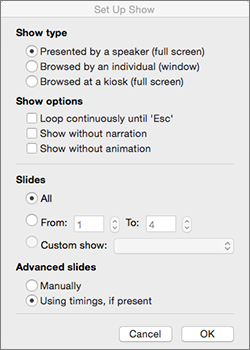 To turn off recorded narrations, ink, and the laser pointer: On the Slide Show tab, clear the Play Narrations box. You can record a narration before or during a slide show and include audience comments in the recording. If you don't want narration throughout the presentation, you can record comments only on selected slides or turn off the narration so that it plays only when you want it to play. When you add a narration to a slide, a sound icon appears on the slide. As with any sound, you can either click the icon to play the sound or set the sound to play automatically. To record and hear a narration, your computer must be equipped with a sound card, microphone, and speakers. 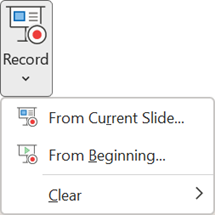 Before you start recording, PowerPoint 2010 prompts you to record either just the slide timings, just the narrations, or both at the same time. You can also set the slide timings manually. Slide timings are especially useful if you want the presentation to run automatically with your narration. Recording slide timings will also record the times of animation steps and the use of any triggers on your slide. You can turn the slide timings off when you don't want the presentation to use them. In this process, what you record is embedded in each slide, and the recording can be played back in Slide Show. A video file is not created by this recording process. However, if you need one, you can turn your presentation into a video with a few extra steps. When you record a narration, you run through the presentation and record each slide. You can pause and resume recording any time. Ensure your microphone is set up and in working order prior to recording your slide show. On the Slide Show tab, in the Set Up group, click Record Slide Show . In the Record Slide Show dialog box, select the Narrations and laser pointer check box, and if appropriate, select or clear the Slide and animation timings check box. Tip: To pause the narration, in the Recordingshortcut menu, click Pause. To resume your narration, click Resume Recording. The recorded slide show timings are automatically saved. You can see the timing in Slide Sorter view below each slide. In Normal view, on the slide, click the sound icon . On the ribbon, under Audio Tools, on the Playback Tools tab, in the Preview group, click Play. In Normal view, click the slide that you want to add a comment to. On the Insert tab, in the Media group, click the arrow under Audio, and then click Record Audio. To record the comment, click Record, and start speaking. When you are finished recording, click Stop. In the Name box, type a name for the sound, and then click OK.
A sound icon appears on the slide. PowerPoint 2010 automatically records your slide timings when you add narration, or you can manually set the slide timings to accompany your narrations. Tip: If you want the next slide to appear either when you click the mouse or automatically after the number of seconds that you enter—whichever comes first—select both the On Mouse Click and the Automatically After check boxes. Turning off the slide timings does not delete them. You can turn the timings back on at any time without having to recreate them. However, when the slide timings are turned off, your slides won't automatically advance when you record a narration, and you will need to manually advance the slides. In Normal view, on the Slide Show tab, in the Set Up group, click Set Up Slide Show. Under Advance slides, click Manually. Tip: To turn the timings back on, under Advance slides, click Using timings, if present. You can either record a narration before you run a presentation or record a narration during a presentation and include audience comments in the recording. If you don't want narration throughout the presentation, you can record comments only on selected slides or turn off the narration so that it plays only when you want it to play. When you add a narration to a slide, a sound icon appears on the slide. As with any sound, you can either click the icon to play the sound or set the sound to play automatically. Voice narration takes precedence over other sounds, and only one sound can play at a time in a presentation. As a result, other sounds that are set to play automatically in a presentation are overridden by a narration and will not play. However, sounds that are set to play when clicked will still play when you click them. As you record your narration, Microsoft Office PowerPoint 2007 automatically records the amount of time that you take on each slide. You can choose to save these slide timings with the narration when you are prompted to do so, or you can set the slide timings manually. Slide timings are especially useful if you want the presentation to run automatically with your narration. You can turn the slide timings off when you don't want the presentation to use them. You can either link or embed a narration. When you embed a narration, the narration sound file becomes part of the presentation and travels with it, resulting in a larger file size for the presentation. When you link a narration, the file size of the presentation is smaller, because the sound file is stored outside the presentation. You specify a location on your hard disk drive for the narration, and the sound file plays with the presentation. If you give the presentation on a different computer, you must move the linked sound file to that computer. The best way to move a presentation and its linked files is to use the Package for CD feature. Or you can manually update the links on the second computer by deleting the narration and then adding back the narration sound file before you deliver your presentation. In addition, when you link narrations, you can go back later and edit the sound files by using a sound editing program. Tip: Accompany the narration with slide notes. Because audiences have different needs and computer equipment, consider accompanying your narration with notes. Notes can benefit anyone who is hearing impaired or whose computer lacks a sound card. If you save your presentation as a Web page (.htm) file, the notes will appear beneath each slide as it is displayed. If you save the presentation as a presentation (.pptx) file, the audience can print the notes, or you can print the notes for them. When you record a narration, you run through the presentation and record on each slide. You can pause and resume recording. In Normal view, select the slide that you want to start the recording on. On the Slide Show tab, in the Set Up group, click Record Narration . Click Set Microphone Level, follow the directions to set your microphone level, and then click OK.
To embed the narration, click OK.
To link the narration, select the Link narrations in check box, click Browse, click a folder in the list, and then click Select. Tip: To prevent possible problems, use the same folder that your presentation is saved in. If you selected the first slide to begin the recording on, go to step 6. To start the narration on the first slide in the presentation, click First Slide. To start the narration on the currently selected slide, click Current Slide. In Slide Show view, speak the narrative text into the microphone, and then click the slide to advance to the next slide. Follow this process for each slide that you want to add narration to. Tip: To pause or resume the narration, right-click the slide, and then on the shortcut menu, click either Pause Narration or Resume Narration. Click the black Exit screen. To save the timings, click Save. Your slides appear in Slide Sorter view, with the slide timings shown below each slide. Note: Voice narration takes precedence over other sounds, and only one sound can play at a time in a presentation. As a result, other sounds that are set to play automatically in a presentation are overridden by a narration and will not play. However, sounds that are set to play when clicked will still play when you click them. On the slide, click the sound icon . Under Sound Tools, on the Options tab, in the Play group, click Preview, or double-click the sound icon. In Normal view, select the slide that you want to start re-recording on. If you already tested your microphone, click OK.
To test your microphone, click Set Microphone Level, follow the directions to set your microphone level, and then click OK. If you selected the first slide to begin recording again, go to step 5. To stop re-recording, press ESC. To continue re-recording, click the mouse to advance to the next slide, speak the narration on the slide, and then click to the next slide to continue re-recording. To end the re-recording before you go through all the slides, press ESC. To re-record through all the slides, when you come to the black Exit screen, click it. To save the timings, click Save. To cancel the timings, click Don't Save. If you want to capture your own comments, the comments of your audience, or both during your presentation, you can turn on narration before you begin your presentation. In Slide Show view, add your speaker comments along with any audience comments, and then click the slide to advance to the next slide. Repeat this process for all the slides in your presentation. Tip: To pause and resume the narration, right-click the slide, and then on the shortcut menu, click either Pause Narration or Resume Narration. On the Insert tab, in the Media Clips group, click the arrow under Sound, and then click Record Sound. Office PowerPoint 2007 will automatically record your slide timings when you add narration or you can manually set the slide timings to accompany your narrations. On the Animations tab, in the Transition To This Slide group, under Advance Slide, select the Automatically After check box, and then enter the number of seconds that you want the slide to appear on the screen. Repeat the process for each slide that you want to set the timing for. Tip: If you want the next slide to appear either when you click the mouse or automatically after the number of seconds that you enter — whichever comes first — select both the On Mouse Click and the Automatically After check boxes. Turning off the slide timings does not delete them. You can turn the timings back on at any time without having to recreate them. However, when the slide timings are turned off, your slides will not automatically advance when you record a narration, and you will need to manually advance the slides. To begin, open the presentation you want and click the Slide Show tab. Tip: If your presentation has a lot of slides, you might find it more convenient to work in Slide Sorter view. Click View > Slide Sorter to try it out. Select the slides you don't want to include, and click Hide Slide. Click Custom Show > Custom Slide Show > + (add). Use the Rehearse button to change the timing between slides without affecting the narration or gestures you've already recorded. Make sure your microphone is set up correctly. On the Mac, go to System Preferences > Sound. If you want to add narration or commentary to the slide show, make sure your microphone is set up and working. Click the Slide Show tab, select the slide where you want the recording to begin, and then click Record Slide Show. During recording, use Ctrl+click to access the recording commands that let you navigate through the slides, change cursors, or trigger screen blackouts or whiteouts. Click End Show to stop recording. A Save dialog box appears. Click Yes to save your recording, or No if you want to record it again. Saving overwrites anything you've previously recorded. If you want to record another slide show with the same set of slides, save your presentation file with a different name. Click Play from Start to preview your recording. When you've finished recording and are ready to distribute the presentation, click Set up Slide Show and choose the options that are right for your audience. Show type Show full screen or windowed. Show options Turn off narration or animations. Slides Choose a subset of slides, or a Custom show if you've set one up. Advance slides Set up this version of the slide show so someone can page through it manually. To do this procedure, your computer must be equipped with a sound card, microphone, and speakers. Make sure that you aren't running any other sound recording applications, such as Speech Recognition. Recording slide timings will also record the timing and duration of animation effects and the use of any triggers on your slide. You can turn the timings off when you don't want the presentation to use them. When you save a presentation as a movie, narration is not saved. In the navigation pane, click the slide that you want to start with. On the Slide Show tab, under Presenter Tools, click Record Slide Show. When you reach the last slide or exit presenter view, PowerPoint prompts you to save the timings. In slide sorter view you can see the timing for each slide. 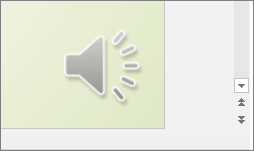 An audio icon appears in the lower-right corner of each slide that has narration. However, this icon is not visible to the audience during a slide show. When you change the narration for a single slide, the timing is also updated. In the navigation pane, select the slide for which you want to change the narration. When you are finished recording, click Exit Show or press ESC. When prompted to save the timings, click Yes. Note: To delete the narration from a slide, select the audio icon on the slide, and then press DELETE. PowerPoint automatically records your slide timings when you record the slide show, or you can manually set the slide timings to accompany your narration. In the navigation pane, select the slide or slides for which you want to manually set slide timing. On the Transitions tab, under Advance Slide, select the After check box, and then type the number of seconds. Turning off the narration and slide timings does not delete them. You can turn the narration or timings back on at any time without having to recreate them. On the Slide Show tab, under Set Up, clear the Use Timings check box. On the Slide Show tab, under Set Up, clear the Play Narrations check box. PowerPoint Online doesn't support recording a slide show. Recordings are added to the presentation on a per-slide basis, so if you want to change a recording, you only have to re-record the affected slide or slides. Also, you can rearrange the order of slides after recording without having to re-record anything. This also means it's easy to pause for a break while recording a presentation. PowerPoint doesn't record audio or video during transitions between slides, so don't speak while advancing the slide. Also, include a brief buffer of silence at the beginning and the end of each slide to make the transitions smooth and ensure that you don't cut off audible narration while transitioning from one slide to the next. You can't record narration in PowerPoint Online. 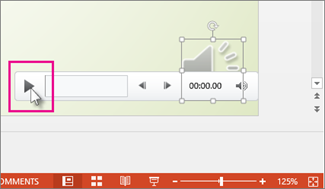 Use a desktop version of PowerPoint to record your narration. You can adjust and edit the size of video and ink in edit view. If it's possible that your audience may use PowerPoint Online to experience the recording, use the transitions that are supported by PowerPoint Online (Cut, Fade, Push, Wipe, Split, Random Bars, Shape, Morph). Presentation recording works best with touch-screen PCs that have a web camera. Use video preview to make sure everything is set up correctly before recording. For slides that you want to record gestures (such as ink) on, make multiple copies of the slide so that you can easily record multiple takes. Then delete the extraneous slides when you're done. Record a few seconds of silence by turning off audio and video to advance after a set time. For higher quality, use an external web cam and/or microphone. Built-in cameras and microphones are suitable for most tasks. But if you want more professional-looking video, consider using an external web cam, if you're able. If you're using PowerPoint on a tablet or laptop and you're inking with a stylus, an external camera and microphone allows you to minimize stylus noise. As soon as you finish your first slide recording, play it back. Before you get too far down the road of recording your presentation, make sure your audio and video sound and look the way you expect.